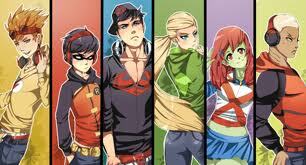 Young Justice is Styleish!. . Wallpaper and background images in the Justicia Joven club tagged: young artemis justice robin kid wally flash superboy. Who's outfit do you like the best?! Robin,Conners,and Wallys with Artemis. those are super cool!! Robin`s is more my style or conners. Hmmm well different opinions all are equal intil the you see one anothers likes. Thanks thats what math does to me I had to asnwer questions personally and im like one of the dumbest in math but was the best. I like Conners the best. Robin's. His is totally cool and civilized but has that Robin touch. He's the only one ACTUALLY listening to music and he's adorable! So...Robin! hehehehehehe(Wow this evil laugh is becoming a habit). Anyhows I will always be here to point out how Robin is more adorable and/or stylin than the others! Your Welcome! XD Oh and his costume doesn't completely cover his waist! It's scary how much alike me and Artemis are. We both: like jeans love archery, are somewhat tempermental, defensive, creative, smack people *cough* wally and nick *cough* upside the head when they ask stupid questions , are ninja-like and are protective of our friends. Plus, we both have older sisters. WHO ELSE WANTS TO BUY THESE OUTFITS?! I'll buy Robin's!!!! CALLED IT!!!!!!!!!!! DIB'S ON BUYING ARTEMIS'S OUTFIT! They would make a killing with a clothing line like this. Btw I would buy out everything. NOT UNTIL I GET ONE OF EVERYTHING ROBIN!!!!!!!! And not until I get Artemis's stuff (including the bow, quiver and arrows!)!!!!!!!!!!! skittles98 and I will team up to take you out if you don't give us what we want!!!!!!! Only Robin and Superboy have swaq on this pic. I'm superboy style mixed with some K.F. but yeah only robs and supes have some real good looks. PS luv ya superoby.! wait did i say that aloud!